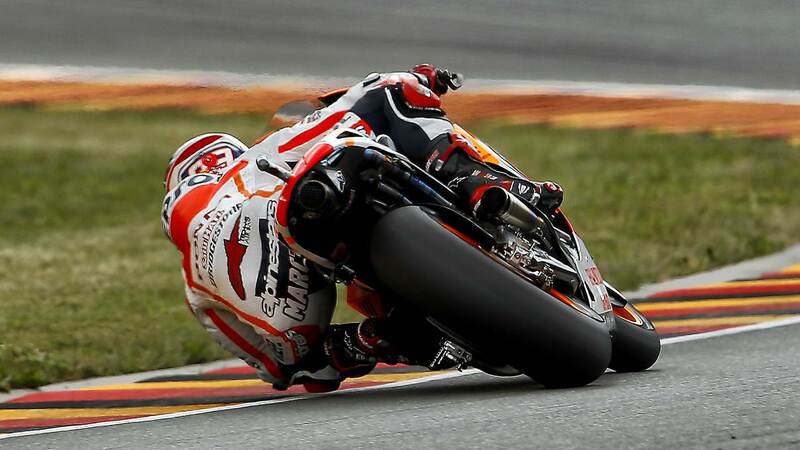 Repsol Honda’s Marc Marquez set the quickest ever lap time at Sachsenring in qualifying for the German Grand Prix, the reigning MotoGP World Champion setting a time of 1’20.937 to head an all-Honda front row for tomorrow’s race. Riding high on confidence after topping the earlier Free Practice 4 session, Marquez’s record-breaking effort came on his penultimate lap in Qualifying Practice 2 and saw him beat teammate Dani Pedrosa to pole position by 0.296 seconds. Hometown hero Stefan Bradl brought smiles to the scores of German fans at Sachsenring by finishing third quickest on his LCR Honda RC213V with a best time of 1’21.340. All the riders on the front row used the combination of the medium compound slicks front and rear for their time attack in QP2. Weather conditions today were slightly cooler than yesterday, and a light rain shower at the start of FP4 prevented some riders going out on track until the second half of the session, although both qualifying sessions were completely dry. The peak track temperature recorded today was 31°C; 13°C cooler than yesterday’s high. The cooler track temperatures resulted in the riders preferring the soft and medium compound options for both the front and rear tyre today. Any of the three front slick options could appear on the grid for the race depending on the temperature tomorrow, with cooler temperatures likely to see the race choice steer towards the soft and medium options. The consensus from riders on their preferred rear tyre choice is the soft compound for the Ducati and Open-class riders and the medium compound for the Factory-class Honda and Yamaha riders. Tomorrow’s weather forecast is for slightly warmer temperatures with a slight chance of rain in the afternoon. The thirty-lap German Grand Prix commences at 1400 local time (GMT+1) but before then the MotoGP riders will be out on track for the morning Warm Up session at 0940. “The weekend has been affected by the crash I suffered yesterday, but I kept my nerve and little by little we’ve been getting better. I felt good yesterday afternoon and I was much better this morning. In the few laps I did in FP4, I could see that we had a good pace and a chance to fight for pole position. With the first tyre I didn’t feel entirely comfortable, but with the second one I had a good feeling and could see that there was good grip — so I decided to push a little more and put in a strong lap. Starting from the front is important for the race tomorrow, because this is a circuit where it is difficult to overtake. We will try and keep up the pace from practice, which I think has been good”. “It was a good qualifying session and we had a good pace, despite the crash which was my fault when I think I hit a bump under braking but luckily I’m fine. I’m very grateful to my mechanics for the work they did yesterday to get the bike back running again after my crash in FP2. Tomorrow we will try to do our best, position ourselves well from the start, make a good tyre choice and hope the weather is kind to us! Our setup is definitely good, so I hope to have a good race”. “Today we worked a lot to find some more rear grip, because yesterday we have been struggling a lot with that; this morning we found something which helped me to be more comfortable and during FP4 we wanted to try another setting in order to improve further, but unfortunately we couldn’t do it due to the bad weather. In Qualifying we continue to struggle when we put the new tyre: I don’t know why, but I have exactly the same feeling when I use either the new or the used tyre. This is not a good sign, obviously. However, in FP4 with used tyres I managed to keep a good pace, so I remain confident for tomorrow’s race, but when you start from the back it’s always difficult to stay with the front group. Anyway, we have to work to improve our performance with the new tyres, because if we have a good rhythm but we can’t start from the front of the grid, it’s quite difficult to make a good result”. “Today we had a good opportunity to go to the Qualifying 2, but at the beginning of Qualifying 1 I made a wrong decision with the front tyre: I went out with the soft front tyre and I felt a lot of movement, so I came back to the pits to go out with the harder one, which was better, and doing so I lost some precious time in the beginning. Moreover, if we check my ideal time, my best lap time would have been three tenths faster: in my best lap I lost most of the time in the first sector. Tomorrow it’s going to be a long and demanding race, we have to see what happens: we will use the rear soft tyre; regarding the front tyre, it will depend on the weather conditions”.